Welcome to Refugee Friday! Today is the TENTH installment of Refugee Friday. Every Friday, through the end of the year, we're partnering with Preemptive Love to share the stories of refugee survivors across Syria and Iraq. Along with giving these survivors a voice to share their story, 50% of orders placed on Refugee Friday will go to Preemptive Love to contribute aid and relief efforts, but ultimately, to restoring dignity after desolation. For these Mosul kids, the world is a little more accessible. Before the war, it definitely wasn’t easy for those with mobility issues to easily get around. But under ISIS and the fall of Mosul in 2014, the lives of those with disabilities were deemed worthless, a burden to society. Many could not flee their homes and were trapped during the war. Families with relatives with disabilities stayed in Mosul during ISIS control. Many lived life without wheelchairs for years, their bodies not being held upright correctly. 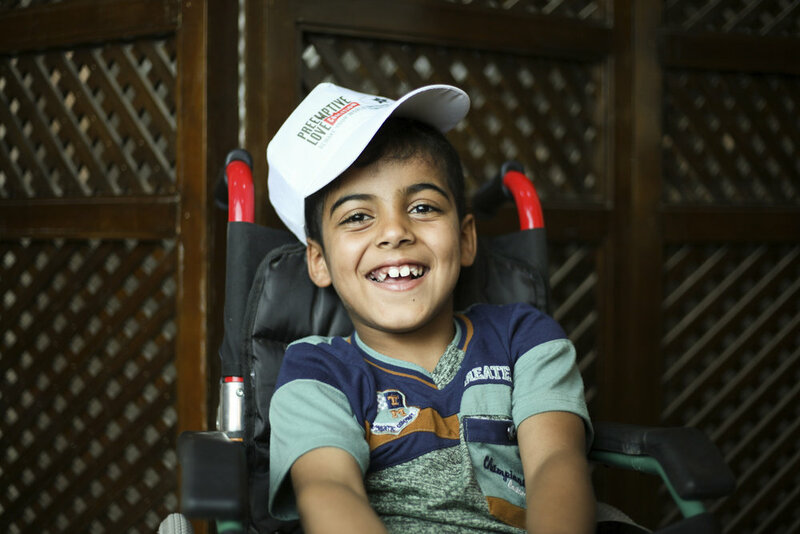 Many with disabilities in Mosul say they feel forgotten, but the Preemptive Love community stepped in and provided correctly sized wheelchairs to 51 adults and 40 kids at one of the few medical center’s accessible to people with disabilities. At these facilities, Preemptive Love is funding the salaries of doctors and professionals who treat not only the medical symptoms of each patient, but also care for their emotional and mental needs. Medical teams visited patient homes, prescribing medication, personal hygiene goods, and other essentials before they came to the facility itself. Show families in Mosul and other war-torn communities that they are not abandoned, they’re not forgotten. Their health, mobility, and being are so important and it’s important to US, half a world away. They are seen. They are loved. And they’ll not be left alone. Join us today as 50% of all our sales will go to contribute additional aid to these souls to provide more wheelchairs. More meals. More healthcare. More dignity.